Undecoded Magstripe reader for connection to controllers. 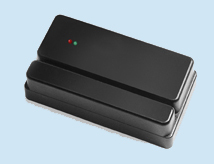 The Mag1 is an undecoded magstripe swipe reader for use in installations where direct magstripe input is supported, such as various access control controllers. The Mag1 is available as a 1 track or 2 track reader, and supports both hi and lo co cards, with low or high density.